Offer more space for individuals to come together to sit, relax and enjoy with these Standard and Universal Access Round Span Leg Tables. Perfect for social eating areas, the round design makes it easy to interact with everyone at the picnic table. The modern span leg frame features elevated bench seats and open walk through design which helps create more leg room and offers convenience when entering or exiting the seats. 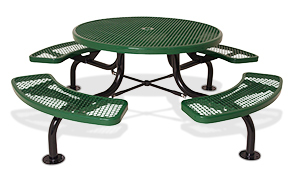 Engineered for longevity with 3/4" #9 expanded steel, the 46" round table and bench tops is constructed with a die-formed expanded metal diamond pattern finished in a non-corrosive, UV stabilized copolymer polyethylene coating. These all-steel tables maintain original form even with continued exposure harsh environmental conditions.